I’ve just finished reading a new book on preaching. It’s written by Yancey Arrington (I’m told Yancey is a good ol’ Texas name) who serves as teaching pastor in a church in Houston. It’s not a book about the tasks of assembling the content of sermons, but focusses instead on their delivery: you will need to look elsewhere for books that cover issues of exegesis and hermeneutics. It’s not that Arrington thinks these are unimportant, it’s just that he thinks not enough attention has been paid to how we better connect with our listeners. While teaching may be content-centred and aim for comprehension, preaching should be people-centred and aim for engagement. All good preaching includes teaching … However, unless the preacher calls for a response … to those truths, what happens in the pulpit remains more lecture than sermon. Arrange for tension – which I think in a sense is a call for more inductive preaching where we don’t give away the point right at the start. It’s a move away from the old advise that the preacher should tell the people what he’s going to say, say it, then tell them what he has just said. Build for pace. Here is where he develops the skiing analogy that is hidden in the book’s title. The sermon’s main idea is the skier’s path down the mountain. Get down too quickly and the sermon is superficial; get down too slowly (too many turns and digressions), and you may lose your listeners. Chart for bandwidth – in which he explores the emotional content of a sermon and argues that the preacher needs to engage a range of highs and lows (as well as some steadiness in the middle) through the course of a sermon. Too much steadiness and it’s boring; too many highs and it’s exhausting; too may lows and it’s sad. Find your voice. Preachers need to be themselves. Influencers (other voices) can help us to find our own voice, but if they become idols, they can prevent us from finding our voice. The book is clearly written in an American context and primarily for an American audience, but you shouldn’t be put off because he talks about getting hot dogs at halftime when your football team has scored a touchdown, or because he hasn’t referred to your favourite European preacher! 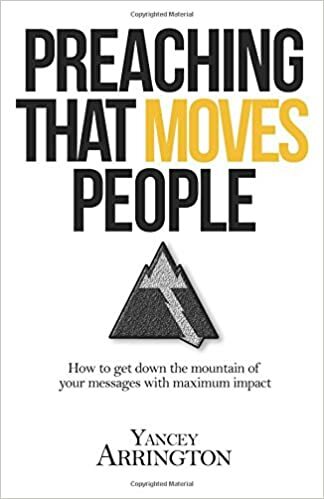 It’s a refreshing read and I think it will probably be of most benefit to preachers who are familiar with more technical material by people like Bryan Chapell (who has written an endorsement) or Sidney Greidanus.